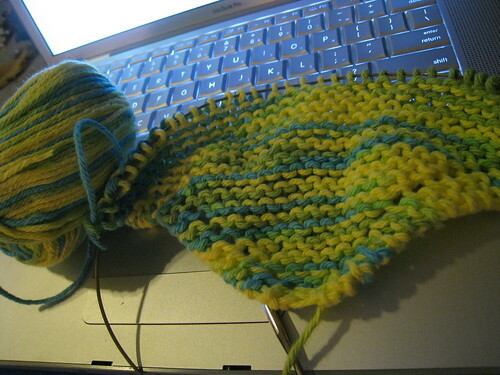 Thing the first: I need to have some travel knitting, something small and mindless for knitting abroad. Right now, that’s a dishcloth. Thing the second: I need to actually work on my sister’s Blue Blossom Shawl so I can finally finish it already. It’s my evening knitting from now until it’s done. Thing the third: The strangest sensation has taken me over and I have an intense desire to do some sewing. Tomorrow I will make a drawstring bag (or two), a hand bag organizer thingy, and some PJ pants for myself and the boys. Thing the fourth: I have a couple of library books (The Lathe of Heaven and Lilith’s Brood) which I have on inter-library loan. If I am ever to finish reading them before I have to return them, I need to spend less time on the Internets. Well…. You know, I’ll TRY to do that.